Saif Ali Khan-Kareena Kapoor Khan’s son Taimur and Shahid Kapoor-Mira Rajput’s daughter Misha are the most popular star kids in town. The stars are always seen fulfilling their parent duties and spending time with their kids. But let’s not forget, single father Tusshar Kapoor is no less when it comes to spending time with his adorable son Laksshya. 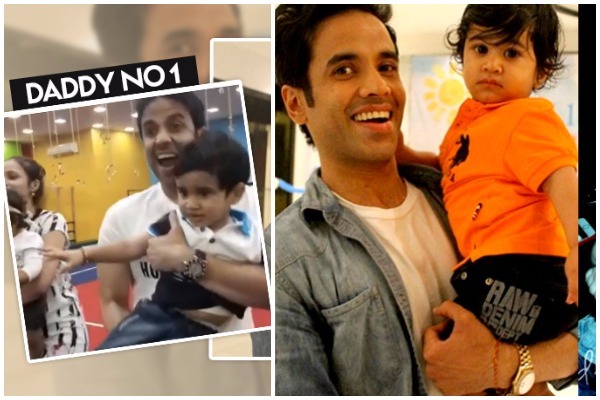 We have come across a video of Tusshar and his son Laksshya and they look super happy as they dance during the playschool activity. While all the kids are with their mothers, Tusshar is the only father attending this super fun session. Tusshar Kapoor is surely setting father goals high for other Bollywood actors. Tusshar shares a deep bond with his son and is one of the most doting and caring dads of Bollywood.